I don't know about you, but I feel like this fall season is going by so quickly. I'm already pulling out some of my favorite holiday party recipes and getting ready to make lots of delicious party food for my friends and family. 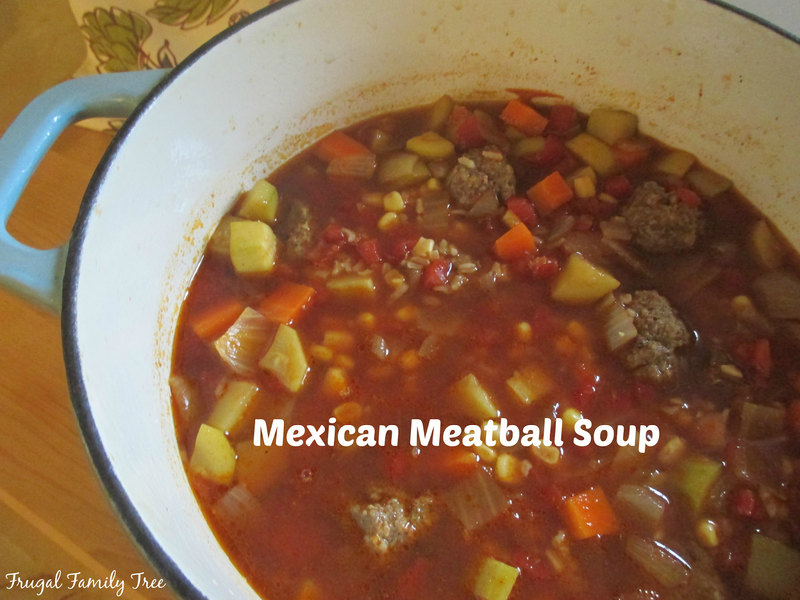 One of my all-time favorite recipes is this Mexican Meatball Soup. This soup, along with cheese enchiladas, has become the traditional menu that we make every year for my son-in-law's birthday, which is on Christmas Eve. 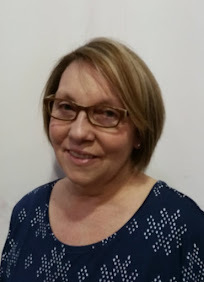 My son-in-law, Jacob, has two brothers with birthdays also near Christmas, and so as a child, he never had a birthday party. In our family, my own children always had parties, so when he married my daughter, we started having a birthday party for him every year. This weekend I decided to make some Mexican Meatball Soup for dinner. It's been so cold, and the thought of this yummy soup simmering on the stove sounded good. 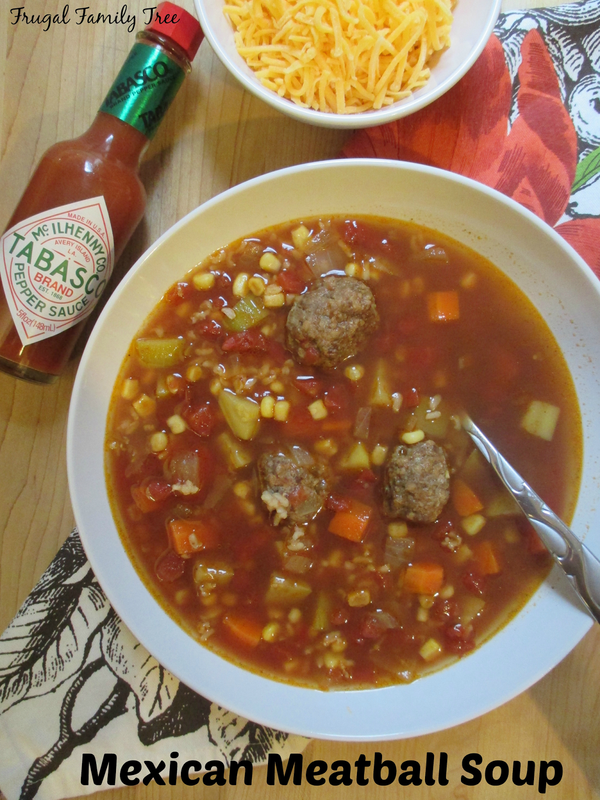 One of the key ingredients to making the soup, especially the meatballs, is Tabasco. It enhances the flavor of all the ingredients, and gives it the perfect kick of spice that makes this soup tastes so delicious. While I was shopping at Safeway, I picked up three kinds of our favorite Tabasco flavors, Original Red, Chipotle, and Jalapeño. It isn't just a condiment, but adds great flavor to stews, burgers, chili, meatloaf, and more. The first step in making this soup, is to make the meatballs. I used to fry them, but now I just pop them in the oven for about 12 minutes, and it's so much easier. To a pound of lean ground beef, add an egg, breadcrumbs, chopped onion, catsup, oregano, and salt and pepper. And for that extra special flavor, add Tabasco. I usually add 3 tablespoons and it's just the right amount. But you can add more or less, to suit your taste buds. Mix up the meat into 1-inch round balls and pop in the oven. I have a hard time resisting eating a few when they are done, and have to remind myself they are for the soup. They are good! Chop zucchini, carrots, and onions and put into a Dutch oven or large soup pot. Add garlic. Cook for about 8 minutes , then add salt, pepper and taco seasoning. 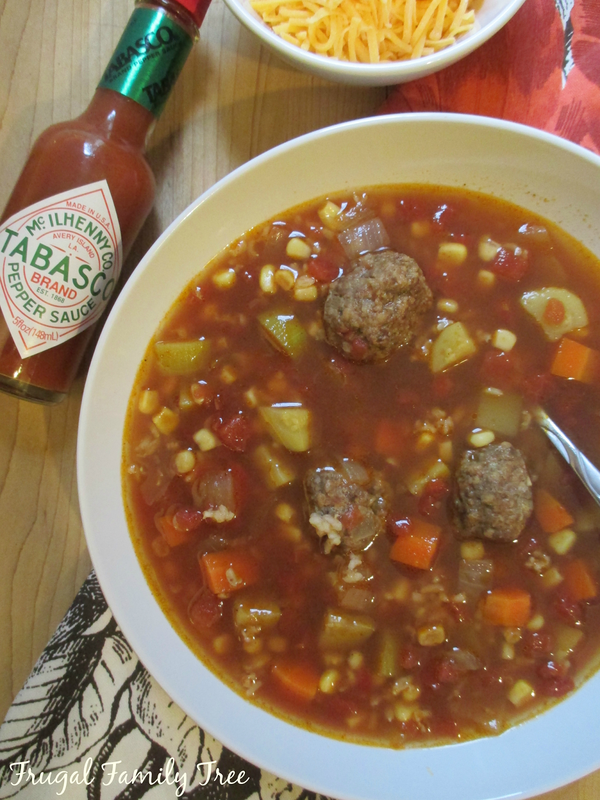 The Tabasco and taco seasoning add great flavor to this soup, without making it too spicy. I always use the Original Red flavor when I make this recipe, but I think the Chipotle or Jalapeño flavor would work well, too. I'm a big fan of all the flavors, and so is my family. After the vegetables have cooked and slightly softened, add the beef broth, a can of corn, a can of diced tomatoes, 1 cup of cooked rice, and the meatballs. Then add 1/2 teaspoon salt and pepper, 2 tablespoons Tabasco, and then let the soup simmer for 30 minutes. I have made this soup with and without the rice, and it's great either way. But the rice does make the soup stretch even further, something I learned one year when we had more birthday party guests than we expected. And I always have the Tabasco on hand when serving the soup, for those who might want to add more. I found Tabasco in the condiments and sauces aisle at my local Safeway. They were even on sale, which made me pretty happy because I love saving money when I can. I really love cooking, especially during the holidays. And I'm always looking for ways to make my recipes taste extra special, and using Tabasco does that. I'm looking forward to making my Mexican Meatball Soup and enchiladas again this year for my son-in-law's birthday, and having the whole family gathered to celebrate. What dishes do you serve every year during the holidays and have become a tradition in your house? 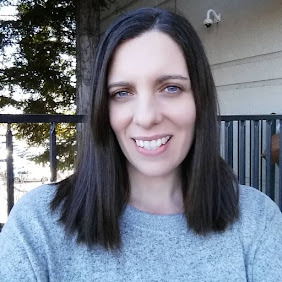 Leave me a comment, I would love to know! Mix together meatball ingredients in a bowl. Shape meat mixture into 1-inch meatballs and place on an oiled cookie sheet. Bake in a 350 degree oven for 12 minutes, turning them once after 6 minutes. Set aside. In a Dutch oven or large soup pot, heat oil. Add the onion, zucchini, carrots, and garlic. Stir and cook for about 8 minutes, or until vegetables have slightly softened. Add taco seasoning and salt and pepper, stir. Add beef broth, meatballs, tomatoes, corn, rice, and Tabasco. Stir together, let simmer on low heat for 30 minutes. Taste, and add more salt, pepper, or Tabasco if desired. wow! I'm going to need to make this soup!!! Sounds perfect for a cold winter meal and adding Tabasco makes it perfect!